Big news from Divest Harvard! Last Friday, President Faust gave a speech to hundreds of parents and students for Junior Parents Weekend. 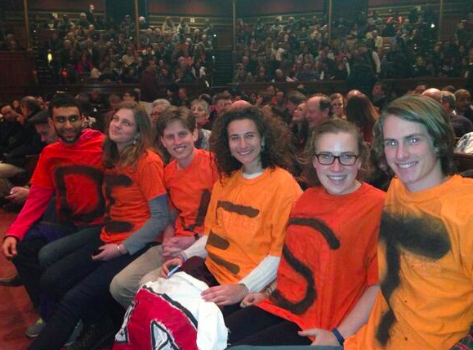 Divest Harvard members sat in the front row, spelling out “Divest” in t-shirts. We released the video and broke the news on ThinkProgress. Check out the entire article here. I was struck watching the video by the big age difference there. The generation gap is perhaps part of the problem in solving climate change. I bet polls would indicate that there is a higher consensus among the youth agreeing that climate change is extremely serious, and anthropogenic. Not good, considering most of those in power in government and industry are older. I would think somebody representing a prestigious institution of higher learning like Harvard would be more intelligent. Divesting, just like rejecting Keystone, is a total ‘no-brainer’. To not, is untenable. Thank you very much for your comment. I absolutely agree with you! Youth have an unprecedented moral authority because it’s our futures on the line. Harvard, which invests in our futures by educating us, has to invest its money accordingly.